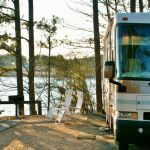 Interagency 50% Senior discount for two nights for a large, paved, pull-thru, 50 amp, water hookup site with a wooden deck overlooking a small cove of Allatoona Lake. A dump station is available. We had good Verizon cell and internet access. The trees prevented satellite TV reception. A busy train track is about a mile away and the noise does affect a quiet evening. 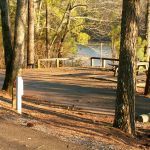 Our GPS directed us to the Allatoona Dam Visitor Center instead of the McKinney campground; be sure to check the directions. We would camp here again. We camped at McKinney Campground COE in a Motorhome. Typical Army Corp park with great views of the lake. Interior roads are paved but, very narrow in spots making oncoming traffic hard to pass without getting off pavement onto soft shoulder. Some sites are close to others, as was mine, but a lot of sites have ample room in between. Very close to Acworth, GA with ample restaurants and things to do but everything is very crowded, expect waits. Entrance roads to campground are very winding and narrow at places, use caution while driving on these roads. Had a nice time inside park during the midweek but weekends are very noisy because of locals partying with large groups of people. We camped at McKinney Campground COE in a Fifth Wheel. The $13.00 rate reflect Interagency Senior Pass discount. This is a very nice campground. It was easy to get into and out of with a 38 ft. motor home towing a jeep. We were in Site #48 which was a level, pull-through. We were able to get quite a few TV stations with out antenna, and cell phones worked well (Verizon). It takes about 15 min. to get to the campground coming in from south bound I-65. We would stay here again. We camped at McKinney Campground COE in a Motorhome.